Dr. Baser will place you on a home skin care regimen that will help remove surface oils, reduce bacterial contamination of pores, and reduce pore size. This system also maintains a healthy hydration of the skin, and may even remove fine lines and discolorations. The most important factor is that this is a gradual process that takes weeks if not months to achieve the results you desire. With the proper guidance, awareness and maintenance of your skin are within your ability to control. Dr Baser. will also evaluate your present makeup techniques and make recommendations regarding proper product selection and application. In some individuals, the products selected to help conceal outbreaks are actually contributing to the severity and frequency of breakouts. What can I do for acne scarring? 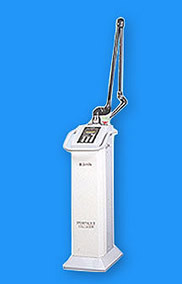 The Hi tech laser Machine used at the ENT &Facial plastic surgery centre.